Now that the agony of a Wednesday-without-Lost is over, I can go back to living life. Thanks to my loud and enthusiastic singing of “Gives You Hell” by All American Rejects , this is now Buddy’s favorite song. Me being a mommy that grew up in the wild jungles of the Big Island with two parents that cussed like sailors, I didn’t really think anything about it until Mr. Pikko pointed out that he doesn’t want our kids to be singing lyrics with the word “hell” in them. He’s right, of course. Lucky for me, Buddy thinks the song is called “Gets You Well”. Ha! Yeah, like she doesn’t know! I’m using up the onigiri that I couldn’t fit into the box yesterday with the legendary fried fish from Y’s Lunch Shop that my brother brought for me on Tuesday. I’m not sure this is enough food for me, but it really should be all I eat for lunch. If I’m weak, I’ll end up going out for some ramen. This bento took me about half an hour to do, but keep in mind that I also did a fruit and veggie layer that I have to stop to take bentorial pictures. The first thing I did was to boil some water in a small pot for the fiori pasta that I got from one of my readers Jennifer. She was kind enough to do a swap with me of two bento boxes in exchange for a bunch of boxes of fiori pasta, which I haven’t been able to find down here anywhere! I’ve been drooling over getting my hands on this stuff for so long and now thanks to her driving around town looking at numerous markets, I’ve got six boxes! WOOHOO! Thank you, Jennifer! I sketched this out last night while watching House reruns. I’d gone to Don Quijote to buy groceries after work and I got myself a new head of green leaf lettuce. This is definitely my favorite lettuce for lining bento boxes because the lettuce is so frilly and tastes great. Usually after I’ve taken out the food I plan on re-heating, I take out the lettuce lining, rip it up, and eat it with my side veggies as a mini salad before my main food. Food cups is one of those items that I don’t really understand. I’ve got like a hundred little cute ones but after using them a few times, I realized they’re pretty silly since you put food in them and cover up the design. So if you’re going to be using these (since they are definitely useful) just buy the big packs of cupcake cups at the market. You can double them up for added strength, but buying the fancy ones really isn’t going to make much difference if you stuff your bentos like I do. 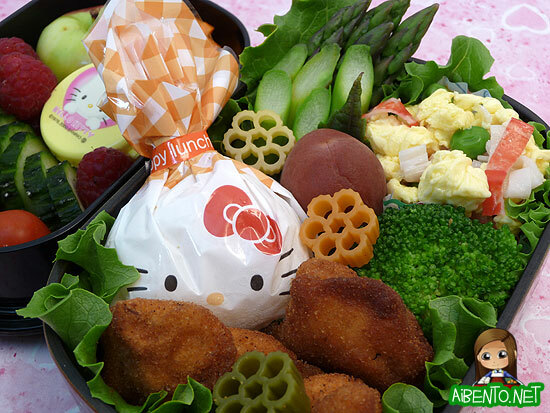 The cup I use in this bento is a birthday design with balloons all over it. For all you know it’s got adorable penguins on it or something. I filled it with more of the eggs I used yesterday. After I’d over-boiled the six pasta pieces I’d put into the pot, I boiled three more, this time taking them out a little early. I let them dry on a scrap of paper towel while I put asparagus and a small piece of broccoli into the water. I left them in the water for about 30 seconds before fishing them out. You really only need the veggies to turn bright green. Any more and you’ll have some really limp veggies. If you think you might have cooked them ever so slightly too long, douse them in cold water so that the heat doesn’t continue to cook them and turn them pasty green. 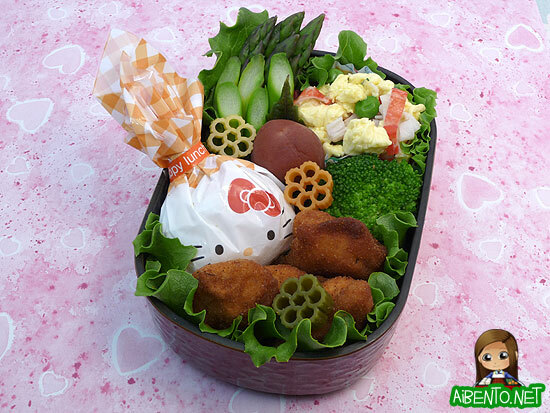 The last thing you want in your bento is veggies that look like pea soup. 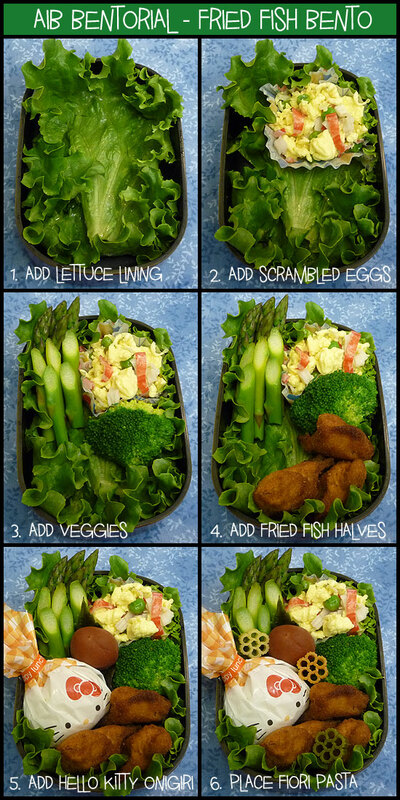 The asparagus went on the top left and the broccoli just under the eggs, squishing them up to make room for the fish. I cut two pieces of fish in half and added three to the box, gobbling up the last piece. Next, I added the onigiri in the wrapper, then a red shiso leaf with a karikari (sweet and crunchy) ume on top of it, which I find amusing since red shiso is used to give umeboshi it’s red color. Shiso is called perilla in English. Last of all, I added three fiori pasta pieces, one of each color. I love, love, love this stuff! In my fruit/veggie layer I have tomato and cucumbers to go with my lettuce lining, sliced tangerine, a lady apple, raspberries, and kewpie mayo for my asparagus. For Oahu people, registration is now open for my two bento workshops to be held at the Temari Center. I had thought my first session would be a keiki (kids) bento class and the second would be an adult one, but since there’s nothing there specifying what types I’ll be teaching about, I’ll probably show people how to make one keiki and one adult bento for each session. It’s my understanding that there are only 9 spots available in each class, so if you’re interested, grab one quick!